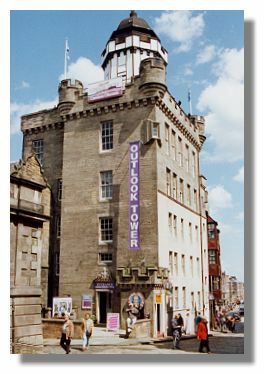 Located at the top of the Royal Mile on Castlehill, just down from the castle forecourt, the lower part of Outlook Tower was built in the 17th century. The upper storeys were added in 1853. Sir Patrick Geddes, regarded as the "father of town planning" converted the building into a "sociological observatory" and added its famous camera obscura which is still there. Next door is a building which was formerly the Castlehill Reservoir (the elevated location helped the flow of water) which has now been converted into the Old Town Weaving Mill where you can see tartan cloth being made. See also Famous Scots - Sir Patrick Geddes for more information. or go to the next Edinburgh location: Paisley Close.